Anything but Plain . . .
One immigrant wildflower of the West Village arrived on the western hemisphere with the earliest of the European colonists. The presence of this plant along the margins of their settlements inspired neighboring natives to call it White Man’s Footprint. 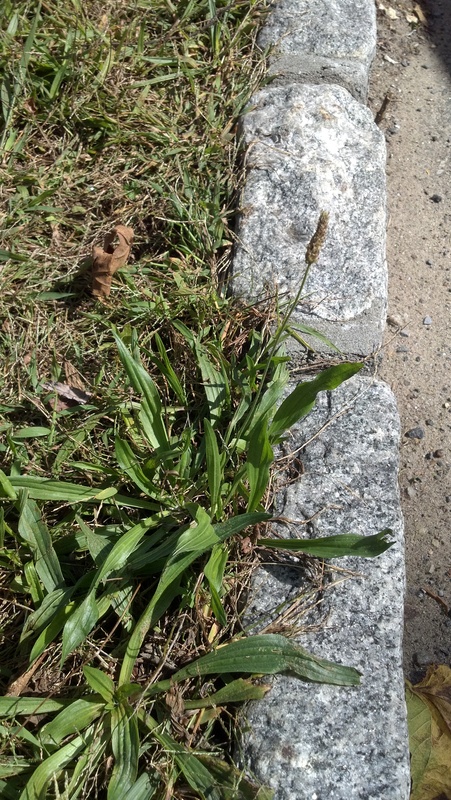 Lawns and sidewalk cracks everywhere today sport the bigfoot oval leaves and stubby green spikes of the common Broadleaf Plantain, Plantago major. Another relative in the Plantain family is, to my eye, one of the most attractive of the naturalized wildflowers. The bloom of this plant is neither colorful nor large, and it is not rare or secluded. What it does possess is the slender grace of its basic form, the geometry of its flowering, which combined provide the primary source of its beauty. 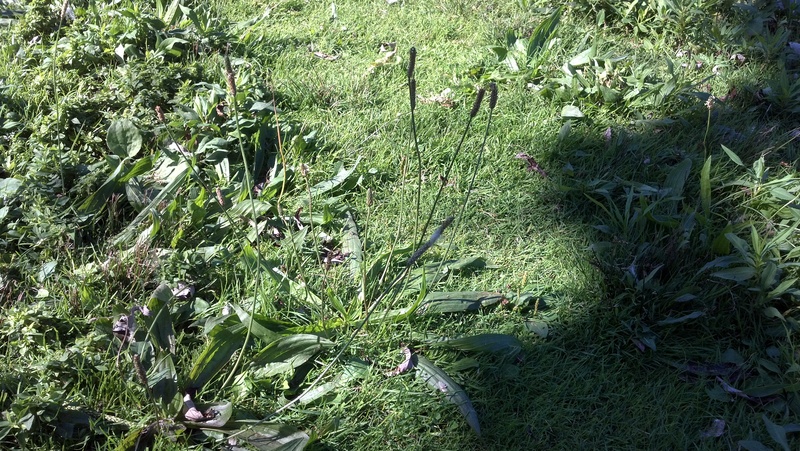 The species I praise so highly is the Ribwort Plantain, more commonly known as English Plantain, Plantago lanceolata. The leaves of this perennial plant are, as its Latin name states, long, narrow, and pointed; a spike unlike its curvy broadleaf cousin. Clusters of these form a tight rosette that can be either prostrate or bushy, depending on the surrounding environment. 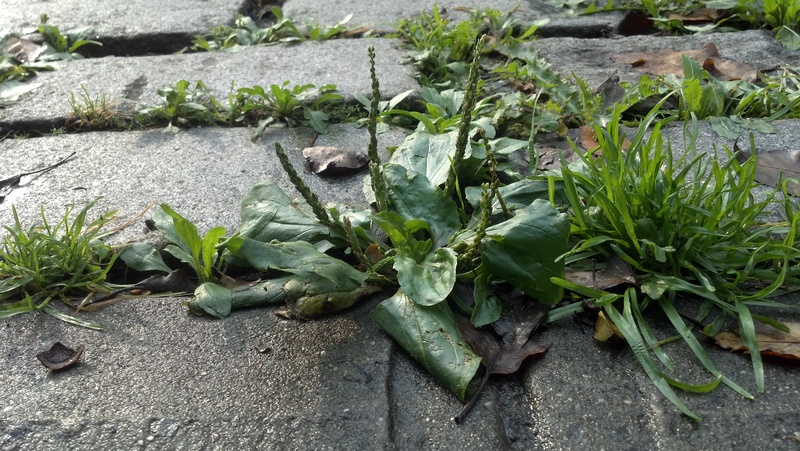 The leaves tend to grow more thickly and upright in consistently moist areas. The flowers top tall, smooth stalks that spread outward on a slightly curved trajectory. A brownish spike resembling an inverted sugar cone shoots out miniscule white stamens that look like a lit sparkler frozen in time. The sight of one of these plants always reminds me of Albrecht Durer’s intimate watercolor: “Das Grosse Rasenstuck” (The Great Piece of Turf). 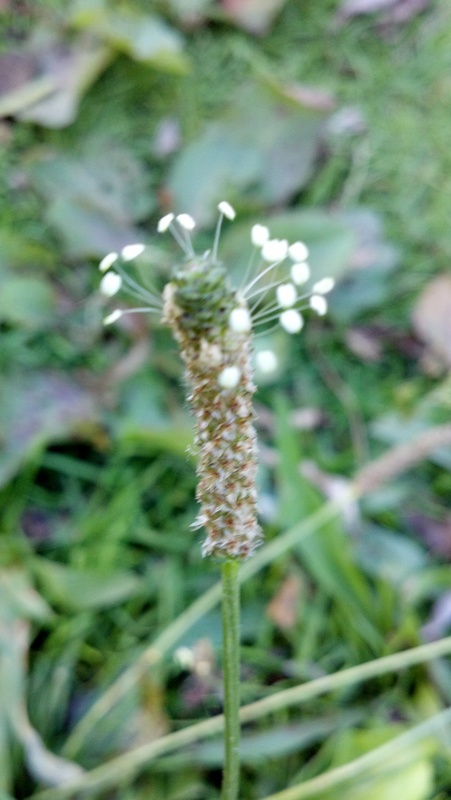 The blooming English Plantain creates a pretty still life wherever it grows, the reason why I love this plant so, and why my lawn will always be left to nature.